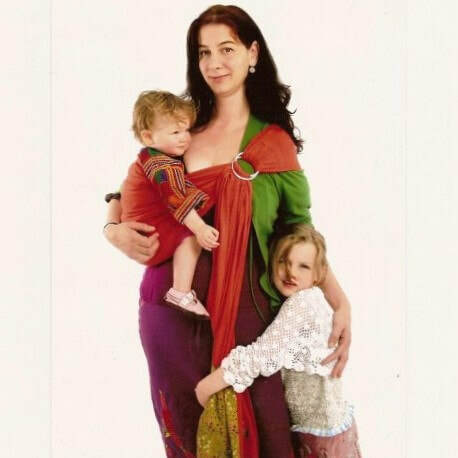 My own interest in babywearing started many years ago whilst I was living, studying and travelling in Mexico and Guatemala. The indigenous women that I encountered daily carried their children everywhere, wrapped snugly against their backs or hips in their colourful hand-woven wraps (rebozos). I instinctively loved the way that the babies and toddlers were carried throughout the day as their mothers went 'back to work'. Even then, many years away from motherhood myself, it had made perfect sense to me that young children should be able to stay close to their mothers whilst the mothers in turn could carry on with the essential tasks of their daily lives. I noticed that the babies themselves hardly ever cried - they were nursed on demand, had plenty going on to stop them getting bored and were routinely cuddled, touched, kissed, talked to, and played with by all the adults and children around them. Several years later I discovered Jean Liedloff's 'The Continuum Concept' which, not only seemed to be describing exactly the type of society I had observed, but which confirmed for me that carrying babies had many beneficial knock-on effects. Eleven years later my first daughter Maya was born. I was determined to carry her with me from day one. Disappointingly, the only commercial sling I could find was a bulky navy blue ring sling with plastic rings. It was so heavily padded that I couldn't tighten it enough to feel that my baby was secure. Compared to the beautifully colourful Guatemalan slings, it was disappointing to have to wear my baby in something so dull. It did, however, introduce me to the adjustability and convenience of 'ring-slings' and pointed out the flaws in the slings available at the time. So, using a rainbow striped Guatemalan shawl, I made my own colourful sling. It was incredibly comfortable and Maya and I loved it! I was forever being asked about it by other mums eager to try something different. By the time my second daughter, Evangeline, was born, I had made many slings for friends and family. 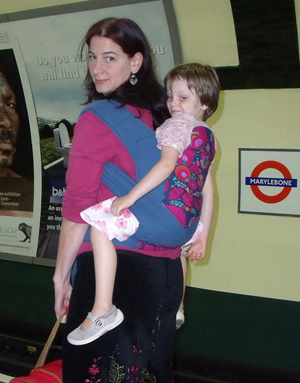 I knew I could offer slings that were not only comfortable and practical, but also stylish and beautifully made and, in that way, introduce more women to the joys of babywearing. So, 17 years after I was first captivated by those Mayan mothers and their colourful passengers, "POUCHLINGS - ORIGINAL BABY SLINGS" was born. I hope that you find here a sling to fall in love with and that you and your baby enjoy it as much as my girls and I have.